Maybe it’s just me, but I never really thought of “chefs” behind canned goods. My sister-in-law, Michaela, over at Serif and Spice introduced me to the Daily Post’s Weekly Photo Challenge. The idea is a topic is announced every Friday, generally vague, and you have a week to create a post based on your own interpretation. It’s a pretty cool concept and again another way to build your blog community. There’s also a Weekly Writing Challenge. I’ve kept my eye on the Photo Challenge topics for a for a while now, just waiting for the right point to jump in. The topic needed to be something fun to photograph but also food related. Though really, it’s AMAZING how you can make almost anything about food. This week the topic was about signs. I had it all planned out. Saturday was also opening day for the Bay Ridge Greenmarket. There had to be signs there to inspire me. Activity announcements, featured produce, special sales. And I was right. There was no shortage of inspiration. Until my weekend took an unexpected turn. Well, expected but with unexpected results. It was my husband’s birthday and like every 30 something year old, he wanted to spend the day at the Transit Museum (please tell me I’m not the only one with this issue…). While he spent his time reading every single word of history he could find, I was more interested in the retired trains on display. Well, more so what was in them. I used to love this stuff! Especially collecting the limited edition character ones. 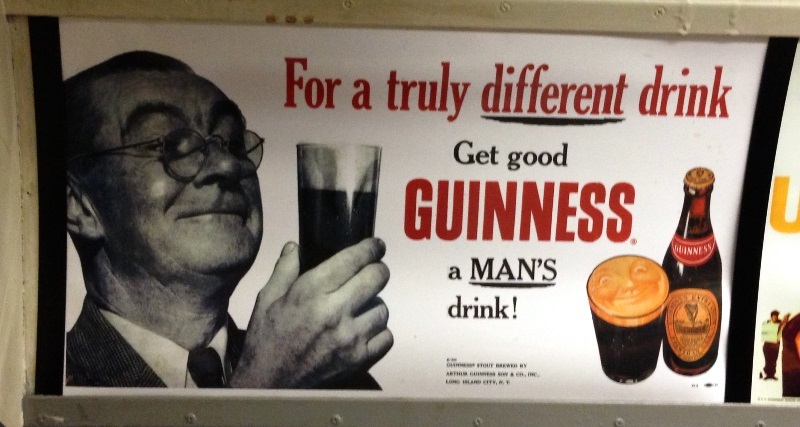 The train cars that ranged in age from early 20s to just a few years ago looked exactly as they would have been when in service, including period advertisements. I don’t know what it is but I’ve always been drawn to vintage ads. Especially about food. For a while I thought the photos of a housewife in her apron fussing over her husband’s dinner, but now I just find it comical. I had similar issues when I first started watching Mad Men, but came to terms with that’s just how things were back then. 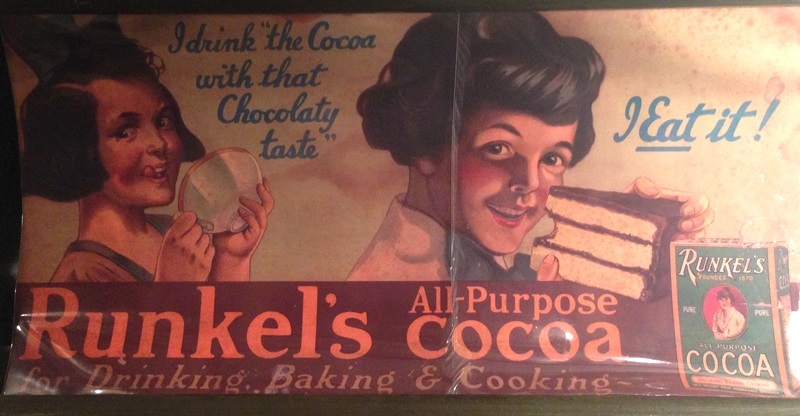 The cocoa drink girl’s a little creepy, isn’t she? While these signs may not be the best display of my photography skills–the shadeless bulbs right next to the ads and the curvature of the train cars certainly doesn’t help–but hopefully you’ll enjoy the subject matter with a little blast from the past. Don’t forget to tongue spread at your next picnic! I have to say my favorite was the Heinz Mayonnaise Salad Dressing. Because who doesn’t want mayo on their salad?! But seriously, I was actually served a salad with mayo in Ireland not even a decade ago. So gross! Eww. I’d like to think we’ve since progressed with our food choices, but some processed stuff out there is just as gross. So which ad is your favorite? I think the photos are a great and a reminder of the past. So many simple things in life have been lost. The sad part about this post is that I can remember some of the advertisements!!!!! Particularly the Campbells soup cans as if it were only yesterday. How time flies. Thanks for the link to my blog….and no I would l not have read every word either……I would be using my camera as you did. You’re welcome. Agreed about the simple things getting lost. I remember backpacking through Europe and a 1000 year old rock would have a simple sign noting someone famous once touched it. Here, if something is 50 years old it’s an antique and if its a 100 years old it faces the threat of being leveled for something new. The US’s history might only be a few hundred years old, but hardy even any of that is allowed to survive. The same applies in Australia. I remeber standing in an English garden and listening to a guide tell us that the tree was planted over 400 years earlier – Shakespeares time. It seems many of those school age are not interested in geography, history, spelling etc these days…..and here am I having a geography lesson while blogging! And loving it. I have a greater idea of where USA states, and other European countries are located since commencing Woolly Muses. There were also a bunch of great Yuengling ads, I just couldn’t get good photos of them. Most along the same lines–meant for a man or a woman bringing her husband a beer. They’re all pretty great.